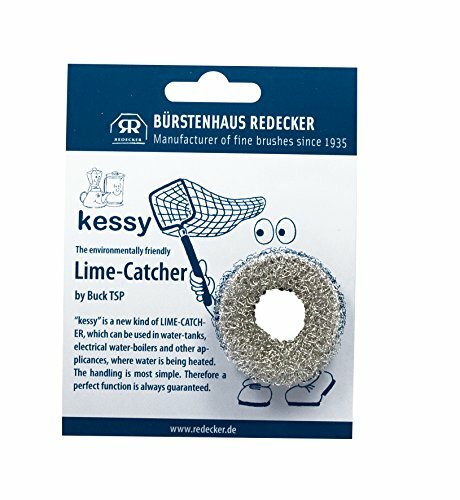 Prevent the buildup of lime scale, calcium and mineral deposits on the bottom of your kettles, pots, pans, water tanks, electrical water boilers and heating appliances with the Redecker Stainless Steel Lime Catcher "Kessy". An eco-friendly method of lime scale removal, reduce water boiling time and energy costs with this simple, easy-to-use solution. To use, place Kessy in container with water and heat water. Stainless steel mesh will turn white as product safely absorbs lime from the water. To clean, simply allow Kessy to dry, tap clean and reuse. Measures 1-3/4" long. Made in Germany.